Just outside Harvard Square, Cambridge, you may happen upon a crowd of people on the sidewalk outside a handsome storefront. Some are just standing there, others on one of the benches, and still others sitting on the sidewalk. This is Darwin’s, which has something for many. First of all, it’s located away from the gentrified retail district of Harvard Square, so it’s more $ reasonable. It’s most popular offering is as a deli, where you can choose from dozens of extremely well-crafted, highly acclaimed sandwiches for under $6. There is a line. It’s also a market, albeit a little high end. Still, it’s there if you need one in an emergency. 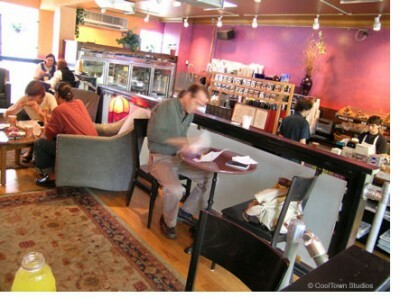 It’s also a coffeeshop and bakery (image). Notice how the seating area is raised above the floor? You feel like you’re in your own lounging realm, and you get the feeling that no one cares how long you sit there. They don’t. That’s a trait of a third place.